Most TDs used on window client, choose this tool as their favorite hate. But truth is that web BBO offers much superior ways to do adjustments as it involves less, or even none of typing and therefore avoids mistakes. You can do adjustments at couple of different ways, from lobby, from the table that is being adjusted, even being at some other table where you are doing something else. 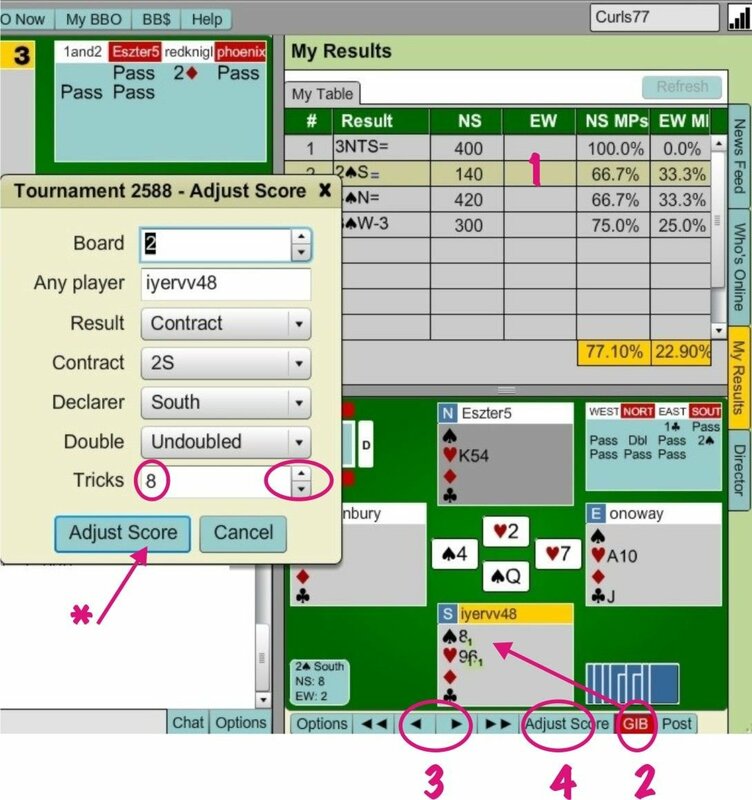 Adjustments also can be done at ANY time, while hand is played, one round later or even after the trny is finished - you still have 20 mins to adjust all you didn&apos;t have time while it was running. When you hit ADJUST SCORE button, Adj tool shows. • and finally tricks taken. Most of times you will only change number of tricks taken. Use arrows next to TRICKS (1) or type number you want in there (here we changed 9 to 8, so result becomes 3S-1). Then hit ADJUST SCORE button (0) and Adj box will close. 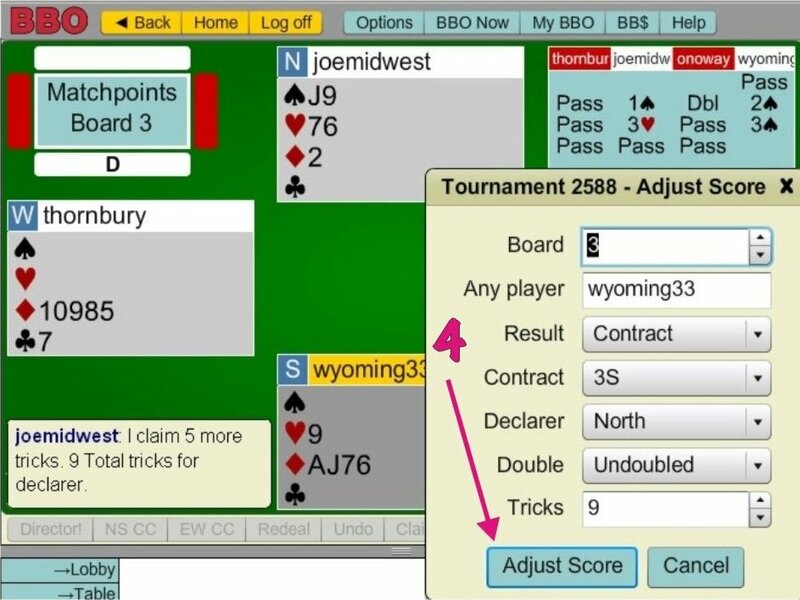 If play of the board was not finished, BBO sets it automatically to AVE. In Adjustment tool click on Result drop-box (2) and select Contract. Immediately BBO will fill it with data, correct contract that was reached by auction, who declared etc. By default it will give number of tricks that would be done if contract was made without overtricks (3S=). If you agree with that, hit ADJUST SCORE (0) right away and Ave will be replaced with 3S=. 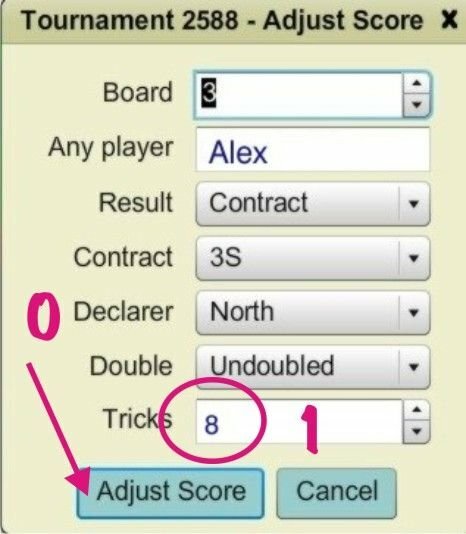 If instead you think contract had to be set by one trick, change Tricks to 8 and then ADJUST (0). Sometimes you would want to overrule final contract to some Ave score (2). North-South are always first listed, so Ave+ Ave- will give Ave+ to NS and EW will get Ave-. Ave will be replaced with 3S-1. Keep in mind there is no reason to get stressed, adjustments can be done ANY time. all adjustments we couldn&apos;t do before, as we were too busy. When you get a request to adjust something, whisper "I&apos;ll have a look" and finish whatever you are doing, as looking for sub, lecturing different table for some infraction, whatever. Only when you are done with all your current more urgent tasks, turn to that adjustment. Lets say you were called because wrong claim of 8 tricks was accepted but actually contract was making with one overtrick. 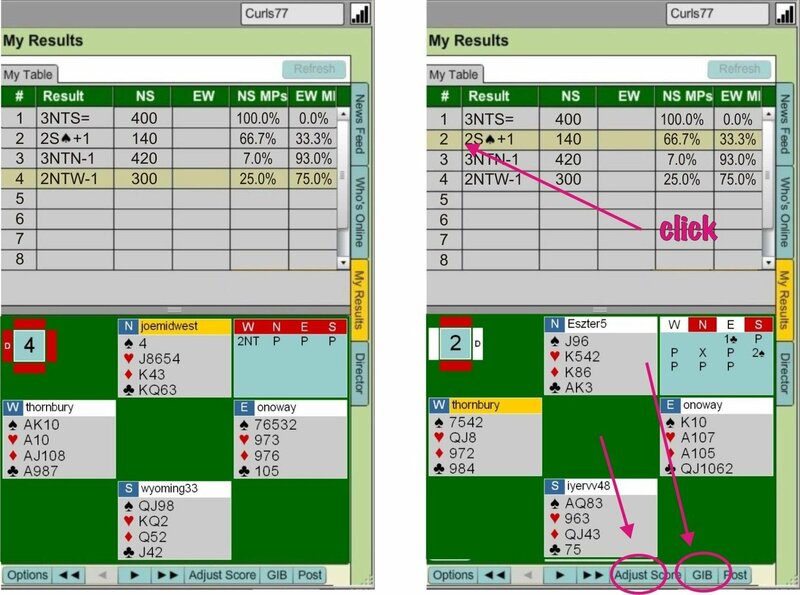 If you want to make adjustments from the table, you must go to the NS pair that played board in question. You select that board lets say it was second one, marked as 2S=in MY RESULTS. 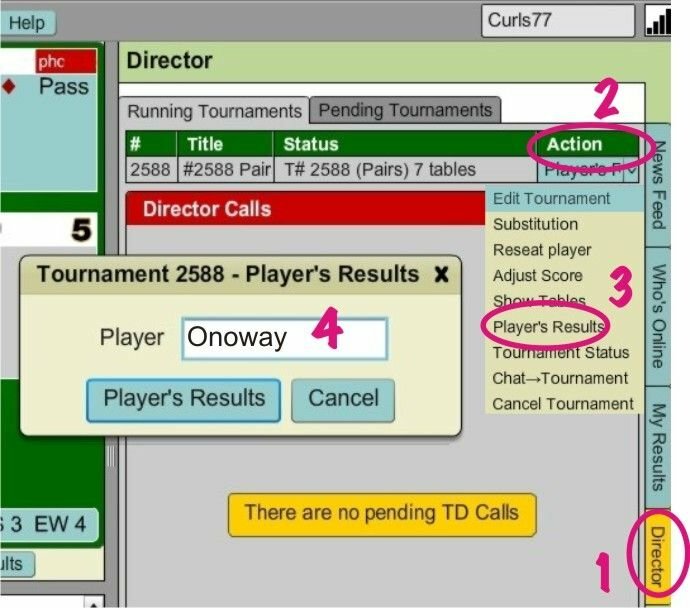 With your decision made, hit ADJUST SCORE button (4). 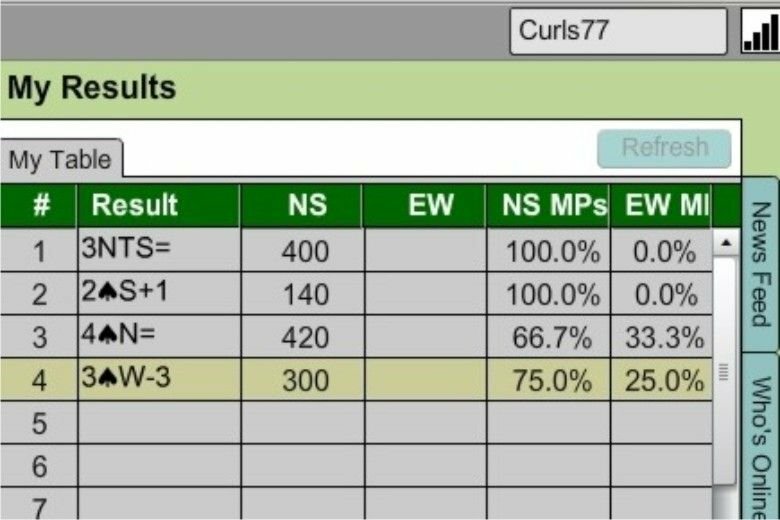 List with results will change and assume new given score 2S+1. If you made mistake, nothing to worry.Lets say u actually wanted to set it as 2S+2. Just hit hit ADJUST SCORE (4), set tricks to 10 and click on hit ADJUST SCORE (*). Result list will assume now 2S+2. As you can see we adjusted board number 2, and table is already playing board 5. - no reason to get stressed, adjustments can be done ANY time. Only nag in this example is that if East or West called you, you must find out whom they opped at that board and go to the NS table. But there is a very neat solution to this. You can make adjustments, without being at the table. Or even being at some completely different table that you are baby-sitting to prevent them argue. Lets say a East player from previous example called you to adjust board 2. In the box that appears type the name of that player (4) and click on Player&apos;s Results (5). Your right part of the screen will change and you&apos;ll see listed ALL boards that player played in the trny, last being selected (board 4). Click on board in question (board 2) and make adjustments as previously explained. You haven&apos;t moved from where you were, you didn&apos;t lose time finding where East player was sitting on board 2, this process takes you 20 seconds at most! Again, lets a player sitting East, calls to adjust a board that stayed as Ave.
and look in her results, you&apos;ll see two boards played,and easily adjust that Ave board to 3N they actually played. 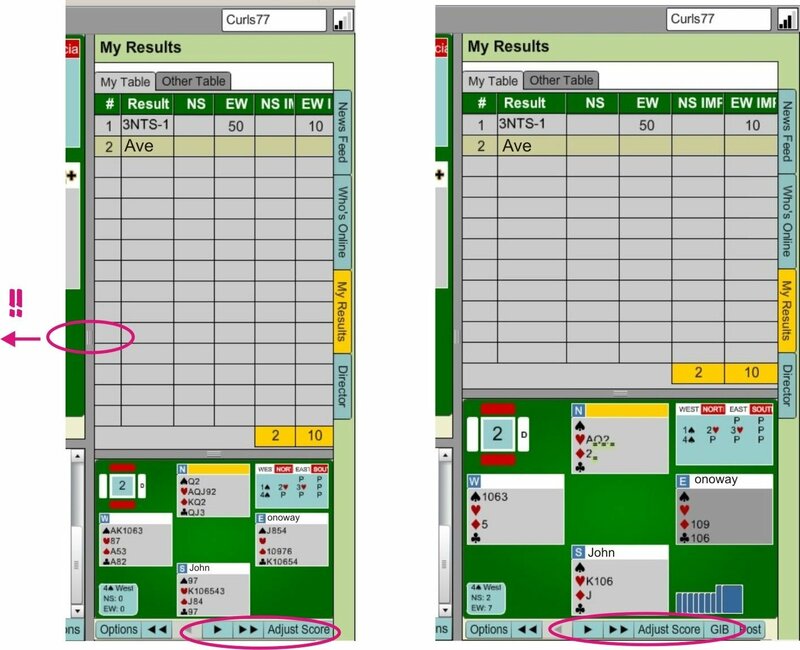 But if John, sitting south, called TD and we looked in HIS results, they might appear as shot on the right. This is because John came as a sub for original South player we lost. 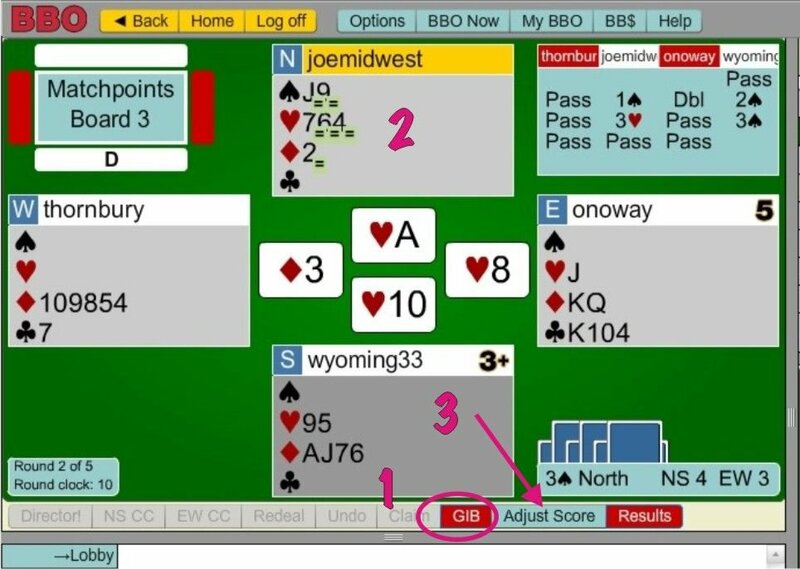 So he never played board 1 and it&apos;s not in his result, but that board will be in onoway&apos;s results, as well as in of N or W.
Can you really "easily" adjust board 2 shown on the left? You can see contract and with arrows you can see how play went, but where is GIB button?? It happens that I resized RESULTS area, and not all buttons are visible. That&apos;s why you should click at (!! ), drag it to the left, which will increase area given to results (significantly wider at shot on right), and your GIB button is there. C) Adjusting board that is still being played. Lets say one table is behind, everyone else waits on it to move to next round, or player claimed and it was refused, altho good. You can have a look at the bidding, check played tricks and remaining holdings, or simply hit GIB (1). It shows likely outcome (2). that will open Adjust tool. 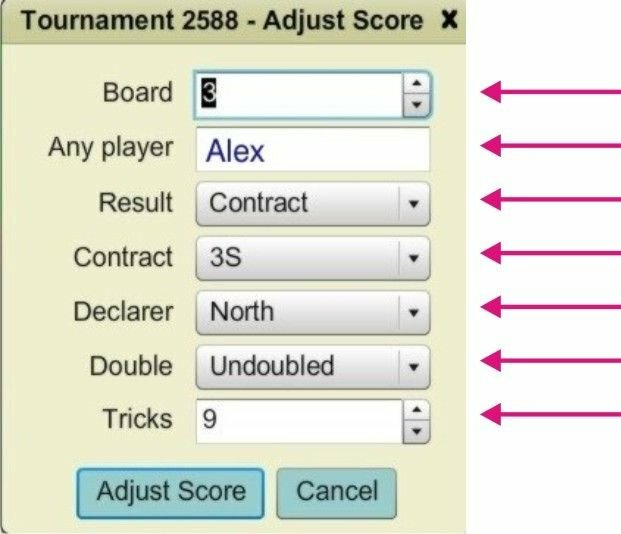 BBO automatically fills board number, declarer, contract, if it was doubled or not, etc. In this case, I&apos;ll just hit ADJUST SCORE button (4) as I decided 9 tricks is exactly how this board should finish.